I always thought that our 2002 MXZX ski doo was the brightest out there. I might have been wrong because searching on eBay I came up with this I call it psychedelic patch work brilliance. It is a 2004 ski doo MXZX 440. It has the 136 x 2 inch track on it which is a lot longer than ours. The buy it now price is 2,900.00 dollar. This does not include any engine. 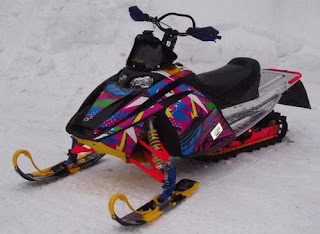 0 Response to "2004 Ski- Doo MXZX 440"